Dig this… a portion of this post is sponsored, but opinions are my own and 110% “pawthentic”! Today marks the official start of Pet Anxiety Awareness Week – an event that I created and launched in 2017 to help pet parents everywhere learn more about the triggers and symptoms of fear, anxiety, and stress (FAS) in their pets. It’s estimated that about 50% of pets suffer from FAS, but many pet parents may not recognize the signs or may not know where to turn for help. Left untreated, FAS may lead to destructive, dangerous, and self-harming behaviors. Sadly, many pets are surrendered to shelters by pet parents who feel under equipped to help them deal with their anxiety. I was inspired by my dog Buck’s affliction with FAS and wanted to help others learn from our experience. Buck struggled with severe noise phobia and separation anxiety. He was absolutely terrified of thunder and fireworks. For a while his anxiety was so bad that my husband and I had to take separate vacations to avoid leaving him with a pet sitter. Eventually we were able to get Buck the help he needed, thanks to a wonderful veterinary behaviorist, Dr. Lisa Radosta. I wish I had known then what I know now about FAS – we all might have been spared a lot of heartache. I know that many other families are going through the same things that we did, and I wanted to help as many of them as possible find relief. If you’ve followed me for long, you know that Chilly struggles with noise aversion, including fear of thunder and fireworks. This time of the year, while most Americans are preparing to celebrate the 4th of July in fun, festive ways, we are planning to stay home with Chilly from June 29th through the July 4th holiday because we anticipate our neighborhood will start the celebrating early. I’ve become quite the expert at July 4th preparations for pets! The first thing we think about are noisy fireworks and how to prepare or protect our pets that react negatively to the strange, sudden noises. But there are other hazards the holiday presents, too. Heat. The Fourth of July falls during what is typically the hottest time of year. Keep in mind that pets don’t cool themselves as efficiently as humans do (and imagine how you would feel lounging around in a fur coat), so heat stroke or heat exhaustion can come on quickly. When the weather gets hot, it’s a good idea to limit walks and outdoor playtime to the cooler parts of the day (usually morning and evening). When pets are outside, make sure that they have access to shade and plenty of cool, clean water. (More about hydration below!) And never leave a pet in an unattended car – even if the windows are rolled down! Water. If you are headed to the pool or lake with your pet, consider that not all pets (especially small or elderly ones) are good swimmers, and they can drown just like people can. Keep an eye on your pet while he’s in water. Pets can become over-tired, heat-stressed, have trouble getting out of the pool, and even get sunburned and dehydrated. Rinse your dog after swimming to remove chlorine and salt from fur. Also try and keep your dog from drinking pool water, which contains chemicals that could cause stomach upset. Hydration. Speaking of drinking water, our pets can easily become dehydrated during the summer months, especially when they’re more active outdoors. According to HealthyPets.com, a dog should drink between ½ and 1 ounce of water per pound of body weight each day, so be sure to provide your pup plenty of clean, fresh water both at home and when you’re out and about. Party Food. If you’re planning a backyard barbeque, or bringing your pooch along with you to a party, make sure the food is safely out of reach. It’s also a good idea to request that other party goers avoid feeding your pet. At the very least, he could end up with a tummy ache from too many treats. Or, even worse, he could ingest something that makes him sick! Several years ago, my dog, Chilly, began to show signs of noise aversion (also known as noise phobia or noise anxiety). Noise aversion is a condition that causes a dog to suffer anxiety during noisy events, and left untreated it can progress from mild anxiety to a more severe condition. Thanks to our experiences with Buck, we recognized Chilly’s symptoms right away and took him to see our veterinarian. Back then, Dr. Amsberry recommended melatonin to calm Chilly during light rains, and he prescribed trazodone (a sedative), for more severe storms. Both of these work well to reduce Chilly’s stress, especially in tandem with some other natural calming products we use. But we didn’t like how the trazodone knocks him out for hours, especially if a storm only lasted a short time. Plus, the timing of the administration of either pill can be tricky, as we don’t always know when a storm will roll in. Needless to say, we were not looking forward to this Independence Day. Fireworks terrify Chilly and leave him trembling and hiding in any corner he can fit in. 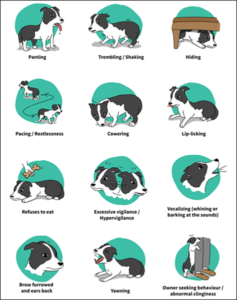 Check out these noise aversion signs from SILEO® (dexmedetomidine oromucosal gel) to see if your pooch may have noise aversion. If your pet has noise aversion, it’s especially important to supervise them closely or keep them on a leash when they’re outside around the time of July 4th. A sudden loud noise could cause any pet to panic and run, but those with noise aversion are even more likely to take off and get lost. Even if your yard is enclosed, never underestimate the ability of a panicky pooch to leap over or plow through a fence! July 5 is one of the busiest days for shelters around the country because many dogs and cats are startled by the noise of fireworks festivities and make a run for it. Even when you’re careful, accidents can happen, so this is a great time to make sure that your pet’s ID tags are up to date. If they should escape somehow, you’ll want whoever finds them to be able to return them to you fast. Of course, if you are the parent of a pooch with noise aversion, taking precautions is important, but if you can help your pup get through the 4th of July without that awful panicky feeling, that’s even better! We wanted to help Chilly be as prepared as possible for the inevitable noisy 4th of July celebrations in our neighborhood, so I asked our vet for another solution besides the trazodone. He prescribed SILEO® (dexmedetomidine oromucosal gel)and said many other dogs he sees were having great results with it. We’re really excited to try it because it’s the first and only FDA approved treatment for canine noise aversion. It works on its own without any other treatments or training, so it’s a simple approach to treating fears resulting from noise. One of the things that really appealed to me about this treatment is that it’s highly effective in calming dogs, but it does so without sedating them. Now I know Chilly won’t be conked out the entire holiday! SILEO® works the way dog parents and their pooches need it to work. It starts working quickly, and it takes full effect in only 30 to 60 minutes. It lasts for 2-3 hours, and you can give additional doses after 2 hours if the noise isn’t over yet and your dog’s signs of noise aversion begin to reoccur. We’re planning on giving Chilly a dose at dusk, before the fireworks start on the 4th, as well as any time we expect thunder. By the time the noise starts, it should be working. Whenever I’m considering a new treatment for one of my pets, one of my top concerns is how difficult it will be to get them to take it. Most dog parents can sympathize with having to trick their pooch into submitting to a treatment. How many of us have disguised a medication or a supplement in peanut butter, or another yummy treat, only to find that our clever pup licked around it and spit it out anyway? syringe between your dog’s cheek and gums to administer SILEO®. It’s that easy! Always review the instructions for use before dispensing and make sure to lock the ring stop properly. Would you like to see how it’s done? This short video shows exactly how to give SILEO®. You can also ask your veterinarian to show you how to use the syringe. For dogs with noise aversion, this time of year can be frightening. It’s our job as pet parents to try to make sure that those fears have as small an impact on their quality of life as we can! Talking to your vet about how to manage your pup’s noise aversion is an important step in helping them. If your pooch is showing signs of noise aversion, you can use this handy checklist to create a report that you can share with your vet. SILEO® is an amazing treatment for dogs with noise aversion, but it’s only available through your vet. You’ll want to talk to him about whether it’s right for your tail-wagging friend. IMPORTANT SAFETY INFORMATION: Do not use SILEO® in dogs with severe cardiovascular disease, respiratory, liver or kidney diseases, or in conditions of shock, severe debilitation, or stress due to extreme heat, cold or fatigue or in dogs hypersensitive to dexmedetomidine or to any of the excipients. SILEO should not be administered in the presence of preexisting hypotension, hypoxia, or bradycardia. Do not use in dogs sedated from previous dosing. SILEO has not been evaluated in dogs younger than 16 weeks of age or in dogs with dental or gingival disease that could have an effect on the absorption of SILEO. SILEO has not been evaluated for use in breeding, pregnant, or lactating dogs or for aversion behaviors to thunderstorms. Transient pale mucous membranes at the site of application may occur with SILEO use. Other uncommon adverse reactions included emesis, drowsiness or sedation. Handlers should avoid direct exposure of SILEO to their skin, eyes or mouth. Failure to lock the ring-stop on the syringe before dosing SILEO could potentially lead to an accidental overdose. Always review INSTRUCTIONS FOR USE before dispensing and dosing. See full Prescribing Information. Sileo® is trademark owned by Orion Corporation Orion Pharma Animal Health. 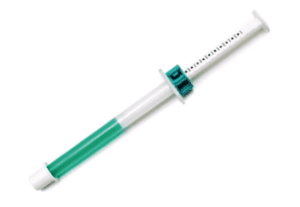 It is manufactured by Orion Corporation and distributed by Zoetis under license from Orion Corporation Orion Pharma Animal Health.